Now to Him who is able to do IMMEASURABLY MORE...: What are you doing with your one and only life? What are you doing with your one and only life? to gain that which he can not lose"
Those were the words of Jim Elliot. But they were more than words... He died living those words! Several times in just the past few weeks my almost 10 year old daughter has shared her thoughts out loud about deep things of the Lord I'm pretty certain I didn't think about when I was her age. I'm embarrassed to admit that maybe I didn't think about the things she sorting through in her heart until only a few years ago, and the funny thing is that God used her adoption to plant these very seeds in me! She can't seem to get over how long eternity is... and how short this life is in comparison! And she's concluded, after much thought, that since this life is so brief and will ultimately determine the outcome of our forever eternity, we should live this life differently! "We should take more risks," she told me, "and do the things that really matter for eternity!" How right she is!!!! But are we? Right now, the big debate in our family is centered around a decision regarding what exactly God wants from us. How far does He want us to go? How much is enough? How many are enough? Which way should we walk? Will He tell us when we've finally "arrived" and should stay? They are the hard questions that we're afraid to ask. Because sometimes the answers mean that God will ask us for more than we ever wanted to give. I've found lately that God will often push us way outside our comfort zones when we're brave enough to ask those questions. Losing this life I hold dear is almost always His plan. But He knows what I continue to forget and what Jim Elliot obviously had his arms wrapped around. In giving what I can not keep, I gain what can not be lost!!! I'm beginning to think that I already know the answers to the questions I keep bringing before the Lord. In fact, maybe it's time I start asking some new questions all together. But these questions are directed at me, and they are the ones God has been asking all along. Here's one.... "What can I do for you, Lord, to die to myself more and more?" And, "Is there a need I can meet that would honor you, Lord?.... that would push me past my own limitations and demand that you show up and glorify Yourself through me?" "Do I have an ounce of energy left to give, that I could give to glorify You?" "Do you need someone to stand up and act in Your name? Could it be me?" So I've been doing some soul searching lately and a small voice whispers to me each time I get quiet enough to hear it... What are you doing with your one and only life, Lori? Kate is right, you know? Life is short and what I do with this one and only life God has given me matters! What am I doing with it? If you look around my home, in my closets, and in my over-stuffed garage, you might find some answers. My debit card statement would reveal even more! Where exactly is my treasure? What am I living for? Would I willingly sell everything I have to possess that treasure? Hmmmm.... I don't know. Maybe I've lost sight of the absolute treasure Jesus is if I'm still clinging to my earthly "wares"!!! I'm pretty certain that if I fully understood His value, I would see the worthlessness of all I hold dear. I need new eyes to see, don't you? I want to see what that man who found the treasure in the field saw! I want to see what Jim Elliot saw! Why then did Jesus tell the story about that incomparable treasure that was worth selling everything else for? I'm convinced that Jesus knew we'd never find the satisfaction we long for in the things we're hanging on to for dear life! He knows that the very things we avoid are worth so much more!!! Letting go of something we can not keep, to take hold of that which we can not lose!!!! Our lives for HIMSELF! What a life-changing exchange! If I REALLY believed that God was all He says He is, wouldn’t I willingly lay down the life I cling to, in order to have ALL of Him? If I believed all He has said about eternity and how to live my life for that day instead of this day, wouldn't I willingly lay down the temporary for the promises of forever? I have a decision to make…. Because living the life Christ died for is so much bigger than the one I'm clinging to right now! I was not called to live life for the here and now, anymore than the saints of old were! What has changed? Maybe we have, but God's call has not. Hebrews 11:13 All these died in faith, without receiving the promises, but having seen them and having welcomed them from a distance, and having confessed that they were strangers and exiles on the earth. 14 For those who say such things make it clear that they are seeking a country of their own. 15 And indeed if they had been thinking of that country from which they went out, they would have had opportunity to return. 16 But as it is, they desire a better country, that is, a heavenly one. Therefore God is not ashamed to be called their God; for He has prepared a city for them. These were God’s heroes!!! And He describes perfectly what a hero should look like! The true heroes (the ones the world isn’t even worthy of) are the followers of Jesus that are willing to lose everything for the cause of Christ… the ones that have their eyes fixed on Jesus and all that is promised for eternity. How the world needs more heroes. How I long to be one of them! Hebrews 12:1- Therefore, since we have so great a cloud of witnesses surrounding us, let us also lay aside every encumbrance and the sin which so easily entangles us, and let us run with endurance the race that is set before us, 2 fixing our eyes on Jesus, the author and perfecter of faith, who for the joy set before Him endured the cross, despising the shame, and has sat down at the right hand of the throne of God. God doesn’t tell us to look at these heroes and try to be just like them! He puts the cherry on top of the sundae and says… “Now, keep your eyes on Jesus” and you, too can be a hero! And HOW did HE do it? He did it for the JOY set before Him!... just like you and I can! Jesus said if we want to follow Him, we would have to “Take up our cross” to do it! “Give up our lives in order to gain them”; “Lose our lives to find them” in Him!!!! That is radical! “Self” is out the window!!!! What would it look like if we really lived for Jesus, instead of for ourselves? Do you know how few people I have even come in contact with that live that way for the sake of Christ? WHY? What is wrong with us??? One of my all time favorite missionaries was Hudson Taylor. A book was written about his life entitled, "It Is Not Death To Die". Hudson Taylor found true life in dying to himself to make Jesus known among the lost people of China. It reminds me of the beautiful song "The Wondrous Cross"... "Oh the wonderful cross, oh the wonderful cross, bids me come and die and find that I may truly live!" It's all right there for us, if we'll only embrace it! We have obviously come to think that we are the exception to this eternal Truth….. But ARE we??? How many of us are really willing to die for the faith we claim as ours? The truth is that not many of us are called to forsake all we know in the name of Christ. But each and every day, on almost a moment by moment basis, every one of us has the opportunity to die to ourselves! “It is not death to die”- And this is God’s plan! Can you imagine how different the world would be, if every so-called Christian lived a life of constant “dying to self” for the name of Jesus??? And the best part? You don’t even have to leave the comforts of home and family to do it! Because for many of us, our primary call to death to self is through the gift of motherhood! (Amen?) And for me personally, the call to 'die to self' smacked me in the face through the gift of adoption. In recent days I have been called "noble". I have been called "wonderful". Just last week a woman wrote that she was in awe of my family! PLEASE! Do you know the bottom line reason I adopted? I adopted to run away from ME!!! I needed something (and God obviously knew it and included it in the Lori plan) that would strip all of the disgusting self-promoting, self-satisfying stuff out of my heart and life. I knew EXACTLY what He was up to…. And because I want to please Him so much, I signed on anyway! This was my opportunity (not my first, but my first to go into voluntarily maybe) to declare with my life…. I will die to myself. And like the man in Chariots of Fire who said…. "When I run I feel God’s pleasure", I could say that as I served the children God had sovereignly placed in my home. I am not a hero, or a saint, or someone special that possess something that you do not. I am simply committed to no longer live the safe life, the comfortable life, the well planned out life instead of the one that will most please God. And the deeper I go, the deeper the joy becomes! The deeper the sacrifice, the deeper the joy. The deeper the pain, the deeper the joy. In God’s pleasure is JOY!!!! So I press on through pain. I press on through disappointment. I press on through hardship. I press on for the joy set before me in Christ Jesus! I press in and ask what more He has for me. I willingly let go of what I can not keep, to gain that which I can not lose! ~Jim Elliot's death was not the end of the story... Several of the wives and children of the 5 missionaries killed, including Jim's wife, Elisabeth, stayed in Equador and eventually reached the savage tribe with the Good News of Jesus Christ. They were welcomed into the tribe as "family" and they raised their children among them, even calling one of the men responsible for their father's deaths, "Grandfather". How beautiful is the redemptive work of Christ! The seeds sewn through the lives of 5 missionaries produced a harvest a Christ-followers! 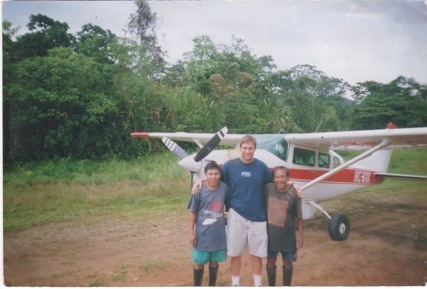 Several years ago my husband, Doug, had the opportunity to travel on a mission trip to Equador and boarded a small airplane bound for the same village where Jim Elliot and the 4 others lost their lives. Their plane was greeted by one of the very men responsible for the deaths of the missionaries and is pictured here on Doug's left. He is now a mighty man of God and one of the spiritual leaders among their tribe! Jim Elliot was no fool! I'm in tears over this post, Lori. You put to paper what so many feel in their hearts - what to do with this one and only life? Thanks for sharing your heart. I am in prayer over this as well. Love you, friend! I just discovered your blog and am enjoying reading your posts as I have time. Imagine my thrill seeing Jim's name mentioned. It is always a thrill to see the younger generation revisiting the story of the Auca Indians and that January morning when the Christian world was rocked to our very foundations. I grew up with Jim Elliot. He was my cousin. He was bright, articulate, fun, absolutely in love with the Saviour, and a wonderful friend. He was 5 years my senior, but I can't imagine him in his 80's. In my mind's eye he will always be forever young. My first grandson is named Elliot after Jim, who was one of my son's heroes of the faith. I haven't kept up my blog, but I've kept it open. If uou go there on the right is a list of subjects and I have written of JIm. I also have written of Bert and Colleen Elliot, his older brother and sister-in-law who labored in Peru for over 60 years. Both died within a month of each other last year. oh what a triumphant entry they must have made the day they stepped into heaven! i am trying to figure your family out....so I shall keep reading.